If your man- or woman-cave is a PC gaming empire, your living room is a third-world banana republic with no fewer than a dozen different factions fighting to rule gaming on your 60-inch HDTV. Well guess what? Razer has just rolled into town with a small army of mercenaries and technicals to start a new junta. The company’s new micro-console offering, Forge TV, lets you play many Android games on your TV and even supports up to four new Razer Serval controllers for a true console-like social gaming experience. Forge TV will stream any DX9 or higher game. Specifically, here's what makes it better than Valve's Steam consoles: Razer’s ForgeTV cleverly lets you stream pretty much any DX9 or newer game to the Forge TV—from Steam, Origin or U-Play. Sorry, Valve—your Steam-only consoles need to loosen up. In a hands-on demo at Razer’s suite yesterday, I tried the Forge TV’s streaming feature and found it acceptable. Remember, you’re talking about compressing a game in real-time and spitting it across your WiFi or ethernet connection to another room and dealing with the input lag from the controller. I did notice a lag of several milliseconds while playing a game using the Forge TV and Serval controller. I also noticed compression artifacts but I admit that also could have been the fault of the large screen television Razer was using for the demo. And to be fair to Razer, it was beta software and CES is not the best circumstances for any product to be demonstrated. You can run up to four Serval controllers on your Forge TV and even use one to play games with a phone. The real gem of Razer’s new announcements is its Turret lapboard, though. The concept of a lapboard isn’t new. Since the only way to get a mouse and keyboard out of a PC gamer’s hands is to pry it from their cold dead hands, peripheral makers have been trying to find a way to get the same controls to the living room for years. The Razer Turret folds up when not in use and slips into its dock for recharging. Razer’s take is quite clever though. Besides the keyboard with attached mouse pad design we’ve seen before, the company thinks it has solved or at least mitigated the problem with the mouse by putting magnets into the mousepad. This helps keep the mouse from sliding off the mouse pad when you stop to type an in game chat message. Don’t think the magnets are strong enough to let you tilt the Turret vertical without the mouse flying off, though, as I learned. 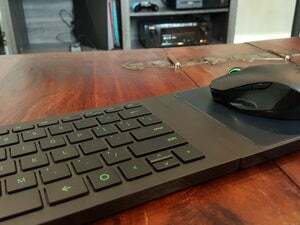 Razer’s lapboard has one killer feature: the mouse “sticks” to the surface using magnets so it won’t easily slide off when you’re taunting people with the keyboard. Still, I’m actually very excited for the Turret and any lapboard developments such as Roccat’s Sova because sometime, playing on a 24-inch or even 30-inch monitor doesn’t cut it.